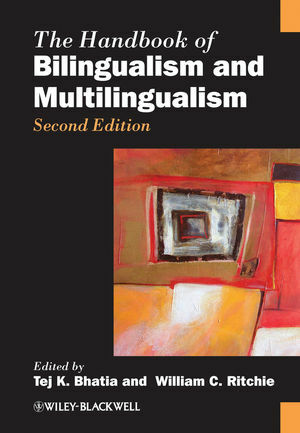 Comprising state-of-the-art research, this substantially expanded and revised Handbook discusses the latest global and interdisciplinary issues across bilingualism and multilingualism. Tej K. Bhatia is Professor of Linguistics and Director of South Asian Languages at Syracuse University. He is a recipient of the Chancellor’s Citation Award for excellence in research. He has published a number of books, articles and book chapters in the areas of bilingualism, multiculturalism, media discourse, socio- and psycho-linguistics, and the structure and typology of English and South Asian languages. Publications include Colloquial Urdu: The Complete Course for Beginners (2000), Colloquial Hindi: The Complete Course for Beginners, 2nd Edition (2007), Advertising and Marketing in Rural India, 2nd Edition (2007), and The New Handbook of Second Language Acquisition (co-edited with William C. Ritchie, 2009). William C. Ritchie is Associate Professor of Linguistics at Syracuse University, where he teaches courses in general linguistics and second-language acquisition. His publications include an edited volume entitled Second Language Acquisition Research: Issues and Implications (1978). He has co-edited four handbooks with Tej K. Bhatia, including Handbook of Child Language Acquisition (1999).